KGR Drill Pipes Exporters are tallied amongst the solid organization included in offering a wide Drill Pipes, cluster of Drilling Hammers. 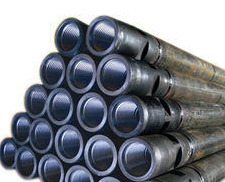 Drill Pipes Exporters offered items are widely utilized for penetrating reason as a part of ground. These are well known in business sector for their bother free execution, fine completing and tough nature. Drill Pipes Exporters create this utilizing premium quality crude material which is source from the legitimate and dependable merchants of the business. Our Drill Pipes Exporters and also an producer utilizing High review strong steels and are intended to perform well. We give an extensive variety of Drilling Hammers, which are widely utilized for any sort of earth penetrating. Further, we guarantee to fulfill the whole prerequisites of our customers in all conceivable behavior. The offered items are accessible in business in different sizes and details. We are the producers, suppliers and exporters of the Drill pipes. DTH Drill pipes along with drill pipes are produced to suit all prominent brands of Button Bits utilizing high caliber of amalgam steels, machined to high accuracy and are hotness treated in the most progressive, completely process controlled office. Drill Pipes Exporters reach of Drill pipes with drill pipes differs from 2.5" to 8" and suits all the famous shank sorts that are accessible in the business i.e., Br2, Br3, Br33, CHEETAH, PANTHER, Dhd340, Mach44, Sd4, Dhd360, Sd6, Sd8 and so forth.